"The persistence of plastic waste in the world is an assault on wild space and what lives there, and a theft from humanity of a basic right to experience nature in the raw." This Memorial Day weekend, VCS and the MV Film Society bring French actor and filmmaker Jacques Perrin to the Vineyard for a spectacular film festival, showcasing his films and the natural beauty within. Films include five of his more recent films, including the North American premiere of Night on Earth, as well as the Academy Award-winning classic Cinema Paradiso. The festival will also feature an opening night gala on the 21st, panel discussions with local environmentalists, live music and comedy, and other special guests. For more information or tickets please see the Film Society's website, or contact them at info@mvfilmsociety.com or (508) 696-9369. Two opportunities to celebrate Earth Day with gardening! 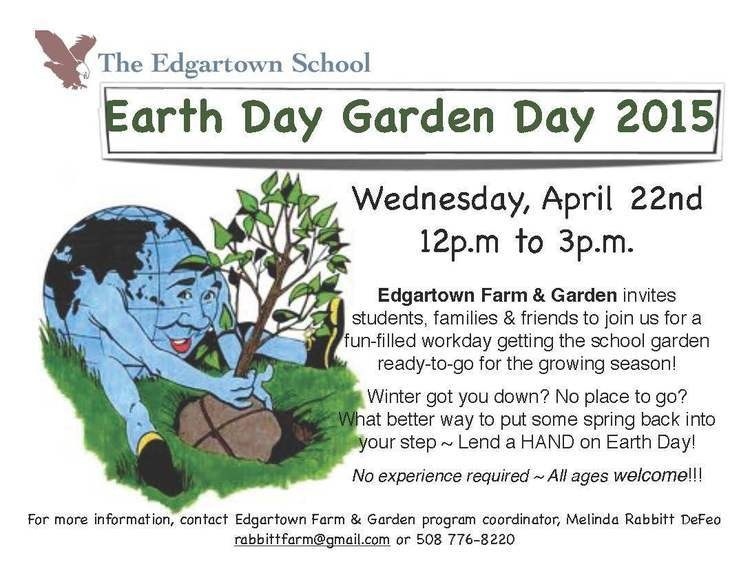 From noon to 3:00, you can help the Edgartown School's Farm and Garden program prepare the school's garden for the coming season (see poster for contacts). Or for some lighter duty, the Edg. Library will be starting new plants at 2:00. Call the Library at (508) 627-9534 for more info. The MV Film Center hosts a free showing of Sustainable Vineyard, and episodic documentary series focusing on the people and projects that are helping to make our island more sustainable. The screening includes three films: The Secret Life of Conch, Goatscaping, and The Story of Seeds. The films are each 10-16 minutes long and will be followed by a Q&A with people featured in each episode. For film descriptions and to register for your free tickets, see website. Join the staff of the Polly Hill Arboretum for the annual celebration of the role of trees in our lives. Tree planting demos, a special tour of the current exhibit "Vanishing Acts: Trees Under Threat," and a tree give-away are all planned. More info at (508) 693-9426 or website. Mass Audubon holds a statewide volunteer day this Saturday, with a variety of activities across their 16 properties. Check the website or call (508) 627-4850 to learn more about the three projects at the Felix Neck Sanctuary, register, and then help them tackle the spring to-do list. A reading group sponsored by Felix Neck and all six town libraries dedicated to discussing the connections between people and nature. The book for this meeting is American Catch by Paul Greenberg. Free, for more info call (508) 627-4850. Join Lank Bank staff for a guided tour of their Tiasquam Valley Reservation on Middle Road. For more information call the Land Bank office at (508) 627-7141. The Art of Conservation Returns! 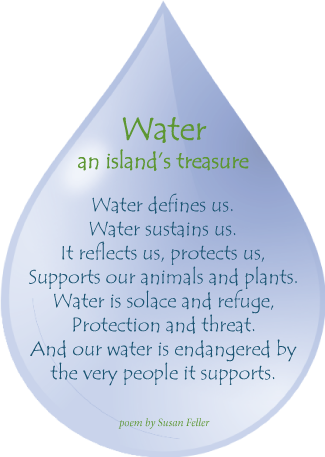 Why does water matter to you? View (and share!) the poster here, and make sure to check out last year's art! 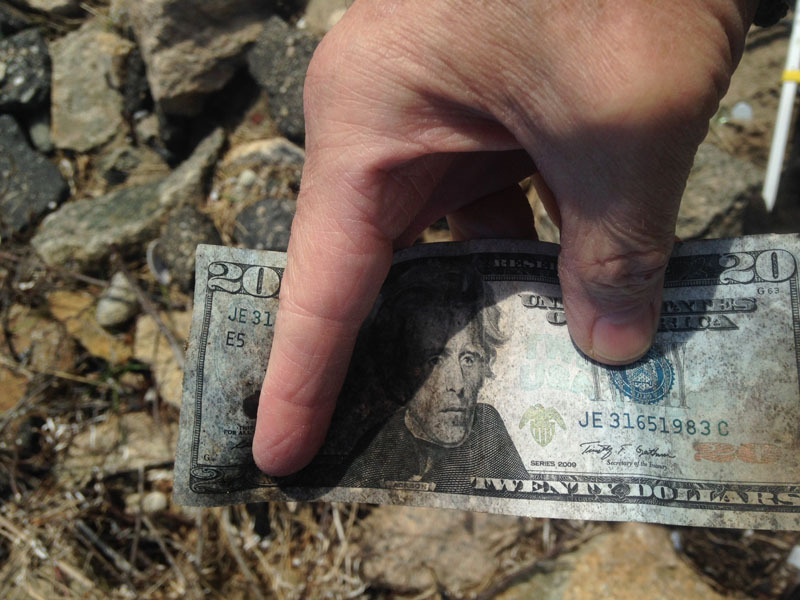 To the over 200 Islanders who helped make the 23rd annual Earth Day Beach Clean-Up a great success, but unfortunately were not so generously compensated, we instead offer a hearty "Thank You!" There were a total of 212 bags of trash collected from 22 beaches, but that doesn't even count the extra large items like fishing nets, rope, big plastic barrels and bait buckets, microwaves, chunks of Styrofoam, deer carcasses, and far too many dead birds. The five most common types of trash were the usual suspects: bits of plastic & polystyrene, balloons & strings, plastic bags, liquor nips, and cigarette butts. It was a mild surprise that the historically strong contender "bottles & cans" slipped out of the top 5, but we're sure they'll make a comeback. Perhaps the oddest of the common finds was dog poop . . . bagged in plastic! It is hard to understand the motivation to go to the trouble of bagging it up only to leave the whole thing on the beach. If you have a guess, feel free to share — we can't form an advocacy message about bagged dog poop until we know what people are thinking! For the 3rd consecutive year, the Harbor View Hotel graciously hosted over 100 people for lunch, with extra food donated from Sharky’s, Isola, and The Wharf. A good time was had by all, especially the younger generation who left with the brand new "VCS Island Adventure" book, a questing adventure game designed to encourage kids to explore their natural surroundings. Read more about the history of this annual event, what we find, and why we do it at the new Beach Clean-Up page. Beach clean-ups are not just about protecting the beaches themselves. This year (like every year since the annual event began in 1992) a very large portion of the trash collected was some sort of plastic. As a class, plastics are the most vexing of ocean pollutants, more persistent than most garbage, and more universal than oil spills and point-source chemical pollution. Public awareness of the problem has grown in recent years, in large part due to interest in (or revulsion by) the five “Great Garbage Patches” of the world: huge collections of plastic circulating in a vortex (or gyre) created by large-scale ocean currents. In recent years, various ideas and technologies have been suggested to clean the garbage patches; unfortunately though, none to date survive serious scrutiny, whether on economic or scientific grounds. Beyond the impracticality of cleaning the garbage patches, more recent research suggests that a focus on these awesome vortexes of plastic may greatly underestimate the real problem. The total amount of plastic in the ocean, while ultimately unknowable, is easily millions of tons simply based on the amount input over the years. However, recent expeditions attempting to measure the amount floating in the great gyres have found much smaller numbers. One study published last June estimated the total amount at a maximum of 40,000 tons, or less than 1% of all the plastic in the ocean. Another recent study came up with 250,000 tons, yet another very large number that nonetheless comes in well short of the total. So where did the other 99% go? The best-case scenario, according to Kara Law of the Woods Hole Sea Education Association, is that a large portion is sinking, attached to organisms (or their feces) and being buried on the ocean floor. Some of it is simply in transit to its next trashy destination — garbage patches are constantly spitting things back out, some of which finds its way to another gyre, some to a distant beach. But the newest explanation for the missing plastic came from a completely unrelated study*. Researchers found microplastics imbedded in the skin of their study fish — farmed salmon, but also wild haddock and carp. We’ve long known that tiny microplastics are assimilated by microorganisms and work their way up the food chain through the guts of larger animals. But if it can also be incorporated into skin, there’s now no doubt the plastic has circled back to our dinner plate — or at least the garbage can from which it began.